Entering through exotic South African Aformosia gates, you are immediately transported into another world, a one-of-a-kind Wallace Cunningham masterpiece, where his site-specific designs engages the orientation of the sun, moon, and stars, together in harmony with earth, air, fire and water, creating a soulful symphonic concert that captivates you. Walls of disappearing glass seamlessly integrate the indoor and outdoor environments, bringing the outside in and the inside out - earth and air. Fire and water then enhance the symphony as both indoor and outdoor environments have fireplaces and pools of water framing the living space. Heated South African slate floors and LED lighting span the entire house. This predominantly single level floor plan has 4 ensuite bedrooms, including a private 4-room master suite. The peaceful bedroom hosts a Zen water garden, a beautiful bath that overlooks the tropical outdoor spa, a steam shower and separate dry sauna. The suite is further distinguished by its spacious wardrobe, a studio/office that opens to a breathtaking lush succulent garden with immense South African acacia tress. The symphony plays on with equally impressive living areas, including a lounge music room, a stunning entertainment room, an exquisite dining room, an intimate family room that co-exists with a marvelous chef’s kitchen, featuring a granite counter top that extends through the glass to the outdoor cooking area, a beautiful theater with its award-winning sound system, and a separate, private 1-bedroom guesthouse. 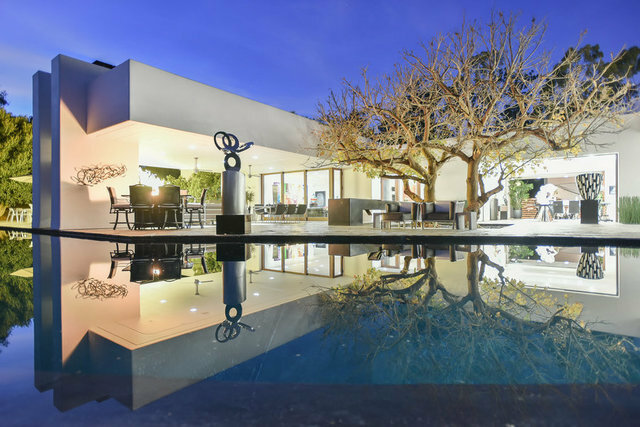 The outdoors presents a graceful massive infinity pool, upper and lower landscape gardens, raised vegetable gardens, fruit trees, attached and detached garage parking, multiple patios and sitting areas. Like a masterful symphony, this home is truly a unique and rare experience! Enjoy the music!